UK retailer Tesco outed the next Call of Duty from Activision and Infinity Ward titled Call of Duty: Ghosts. 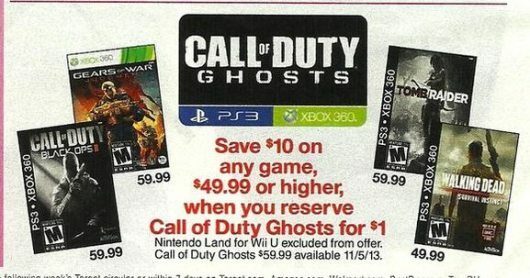 Tesco is a UK based retailer who leaked the title in an advertisement allowing customers to save $10 on any game over $50 with the reservation for Call of Duty: Ghosts. There have been rumors floating around about Infinity Ward’s next title; would it be Modern Warfare 4, or something else? The rumors have been partially laid to rest with this leaked information. The ad also mentions that Call of Duty: Ghosts will release on the current gen consoles. However, nothing is set in stone until Activision makes an official announcement. This next incarnation appears to be dropping the Modern Warfare moniker in favor of a shorter name. It is unknown if the next game will feature a character named Ghost like in the Modern Warfare series, or if this title is more story-related. Rumors on this subject began when YouTube user Drift0r released a video claiming to have information on the next Call of Duty from a reliable source. In his YouTube video, Drift0r claimed that the next title in the franchise will be on next gen consoles and PC. Activision tends to make announcements about the Call of Duty franchise around the month of April, so something big may be in the works. Rumors from Drift0r’s unnamed source claim the game will be set in the future but the combatants will use modern style weapons. Tesco released the ad along with box art for the Xbox 360 and PlayStation 3 but later pulled the Xbox version leaving only the PlayStation 3 image. The box art clearly shows a soldier either putting on or taking off the Ghost mask. Activision has yet to make any formal announcements about the next Call of Duty game. Drift0r and his unnamed source however claim that Activision will be making a formal announcement on or around May 1 regarding Call of Duty: Ghosts. Stay tuned to Gamer Horizon as we will be posting any and all information announced about the next installment in the Call of Duty franchise.